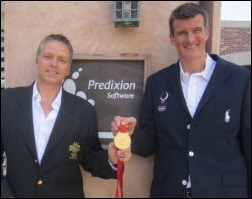 Simon Arkell is CEO of Predixion Software of San Juan Capistrano, CA. He represented Australia as a pole vaulter at the 1992 Summer Olympics in Barcelona, Spain and at the 1996 Summer Olympics in Atlanta, GA.
Predixion Software is a three-year old company. We formed it back in 2009 in order to leverage what we thought was a big opportunity in the business intelligence market. That was this space of predictive analytics, which has historically been technology that is only attainable to the very most-trained data scientists and PhDs with very expensive and complex toolsets. We thought that there would be a great opportunity to take that and break down those barriers to predictive analytics and make it more available to many more people. At a very high level, that’s been our vision since Day One. I’ve been involved in enterprise software for most of my career. I was a co-founder of a number of companies and have raised money from venture capitalists. I’ve even gone over to the dark side and done investment banking and private equity for a little while in order to really learn the business. Each time I came back to an operational role, where I just believe that this particular opportunity was the best I’d seen in my career. The reason for that is that my co-founder and our chairman Stuart Frost had sold his company, which was in the data warehousing space, to Microsoft very successfully. It was his idea to identify predictive analytics as this hot space. The more research I did, the more I realized that we were in a position to not only create a game-changing technology, but also to leverage the success that Stuart had had a DATAllegro with the investor base. At the same time as starting the company, we were introduced to a gentleman over at Microsoft named Jamie MacLennan, who, long story short, came across and became our founding CTO. Jamie had a vision for many years as head of data mining and predictive analytics over at Microsoft to do exactly the same thing, and that was to bring predictive analytics to the masses and to make it more available. With that technical firepower in place up in Redmond, we now have a development office in Redmond, and have had since Day One. Our engineering team is effectively the former data mining team or predictive analytics team from Microsoft. With that story, we were able to be very successful in raising venture capital. We have a very large strategic partner — who is also an investor — that we don’t name, along with three other venture capital firms: Palomar Ventures, Miramar Ventures, and DFJ Frontier. We’re getting ready for our next round of investment. We’ve been very successful in the healthcare space over the last year and a half. That happens to be an industry with a lot of issues and problems that are a great fit for predictive analytics technology. We’re well on our way with a great team in place and getting some really nice early success in healthcare. What kind of healthcare problems can predictive analytics solve and what kind of data is needed to be able to start using it? We have seen many problems in healthcare that are a perfect fit for predictive analytics. The low-hanging fruit, and the one that everyone’s talking about right now due to CMS mandates that are coming down and penalties that commence in October, is around preventable readmissions. We call them predictable readmissions. Effectively, you can get ahead of a problem by predicting an outcome and preventing its outcome. We have nice tagline that says, “You cannot prevent what you cannot predict.” In the case of readmissions, we’re able to assign a risk of readmission to a patient when they admit into the hospital the first time. That admission or readmission probability improves in accuracy throughout the length of stay. At the point of discharge, the hospital is allowed to actually now have very stratified and targeted intervention based on the risk profile of the patient. Being able to assign a risk profile to a specific patient when they admit the first time is something that’s a game-changing solution. We’re able to apply that concept to many different applications, like predicting hospital-acquired sepsis, predicting the length of stay, predicting which outpatients are likely to become inpatients, and the list just goes on and on. We think that being able to predict a particular outcome is what the industry needs. Customers are absolutely responding in a big way. How customizable is the prediction algorithm based on what information a given institution has available, based its choice of electronic medical record or whether it’s doing physician documentation electronically? Very. Everyone wants to build a Lamborghini, but we find that even if you’re not 100% data-ready and have the perfect electronic setup as a provider, you’re able to benefit from this technology. A common term in the predictive analytics industry is that, “lift is lift.” Meaning that if you can get some improvement through machine learning over and above just a human guess, then there’s a return on investment. Over time, if you bring more systems online, that can become more and more effective. We’re seeing very, very accurate models. It’s fairly easy to determine the accuracy of a model because you just apply it to historical data and see how accurate it was in actually predicting what actually did happen. We’re seeing very accurate models, which are measured in terms of what’s called a c statistic. We have the highest in the industry, because we apply our models and our algorithms to the electronic data – whether it’s clinical data, claims data, etc. – at the hospital level. We do not rely on a national algorithm, because no two regions and demographics are the same. You may have a hospital in Minnesota in the middle of winter, which would have an entirely different reason for readmissions than potentially one in Florida. By being local, being agile, being easy-to-use and adapt, we’re seeing a lot of uptake from our customers right now. A few companies did a primitive version of this back into the 1990s, use technology such as neural networks to try to make patient predictions. They really didn’t get very far. Was the problem that their information wasn’t good enough, their algorithms weren’t good enough, or that hospitals weren’t ready to do anything with the information that they were getting? I think it’s probably all of the above. Obviously there are some hospitals that are now electronically equipped and jumping on board all of the various government initiatives to bring them up to an acceptable level. The algorithms are much more accurate. We’ve got significant domain experience now in applying our algorithms or our technology to this problem set. We’re finding that the accuracy of our models is just as high amongst just about every one of the providers that we’ve used this with. The other thing that’s much, much different is how you get the regular information worker in a provider network to actually access this information and respond to it. Having someone with a PhD in a white coat in a back room somewhere crank on these models and algorithms in order to get information is one thing, but how do you actually get that out into the hands of a nurse who can do something about it? We’ve solved that with what we call the last mile of analytics. Two of our customers, just in the last couple of weeks, decided to move forward with our predictive readmissions portal. It’s an HTML5 thin client portal that can be accessed on any workstation or at a nurses’ station or in a hospital room, or even on a iPad or iPhone. It will give the nurse or the case manager a list of the patients that are currently under their care and are inpatients and their risk of readmission. What we’re working on now with our customers is being able to respond according to a risk strata of the patient. Now all of a sudden your patient population of inpatients has a very low, a low, a medium, or a high risk of readmission. The intervention at discharge can be very different now for the first time. Instead of applying very limited resources to all patients that you discharge because you were using just guesswork as to who might be at the highest risk, we’re now able to create an intervention strategy for the very high-risk patients and medium-risk patients and then intervene on them. Intervention to a high-risk patient may mean deciding whether to send them to a home healthcare facility or sending a nurse out every second day and then having someone call every day to make sure the patient’s taking their meds. You would therefore be able to put less attention to a very low-risk patient. You can become much more efficacious or accurate in how you intervene with the patients in order to reduce your readmissions rates. The same concept applies with regard to targeted intervention for hospital-acquired sepsis, fall risk, etc. We’re seeing a lot of new thoughts and excitement come out of our customers who now are able to do something for the first time that they previously didn’t think was possible. It’s having all sorts of ramifications with regard to brainstorming new ideas and applications and solutions. That’s maybe the big difference from the 1990s. The idea then was to redesign a process, like using different drugs or creating different care plans, rather than intervening on individual patients, plus there was no economic incentive since hospitals got paid for readmissions anyway. Even though the technology may have been similar in a primitive way, it was a different climate. Exactly. You know better than anyone as we move from fee-for-service to a wellness-based industry, getting ahead of the problem and actually being able to do something about it before it happens is everything. The ramifications in the UK are even greater. One of our prospects who is about to move forward with our predictive readmission solution received a very significant fine just last month. It was over a half million dollars, just for having readmission rates at an unacceptable level. So you’re starting to see massive payback from putting in a solution that can solve this problem for you. And you’re right, retrospective reporting is really what business intelligence has always been up until now. We’re in the business of putting prospective information into these reports so that you can get ahead of the problem and prevent it before it happens. Again, that’s not new; there are great companies out there like SAS and SPSS, which is now IBM, who have these very specialized workbenches. But again, you’re not putting the end results in the hands of a nurse or practitioner who can do something about the output; you’re relegating it to a back room with some guy with a white coat. Kaiser Permanente is probably the most advanced user of healthcare data in the country and they’re your customer. How are they using your product? They’re fairly private in how they announce their utilization of our technology and any other, but I will say that they’re being very aggressive with some of the stuff we’ve already talked about. You made two trips to the Olympics as a participant. What would you say were the best and worst memories? Good question, because everyone always talks about kind of the excitement and the best parts of it. I have learned a lesson since competing in the Olympics. Enjoying the journey is something to be embraced. I do that now in my career and in my life as much as I can. The best part by far was living a dream and having it turn into a reality. From the age of 11, all I ever wanted to do was compete in the Olympics. The problem when I was 11 was that I wasn’t very good at anything, so I had to find my way. When I discovered pole vaulting, I absolutely fell in love with it, but realized I wasn’t very good at that, either. But my best friend was very good at it, so we kept getting invited back, and 20 years later, I got to compete. It was a long, long journey, and one where the biggest lesson for me was that hard work and persistence absolutely pay off. I really was so excited to be walking into the opening ceremonies and marching in the Parade of Nations for the first time in Barcelona, which I then did again four years later in Atlanta. I’d say the worst part, though, was not performing to the extent that I was capable of and being too attached to a specific outcome as opposed to really just embracing and enjoying every second of it. I would think it must be unusual for Olympians who have focused much of their lives on a single sport to suddenly do a 180 and go out and establish themselves in the world of business, especially a technology-related business. How did you get from one to the other? The concept of risk is not one that I’m unfamiliar with. When you’re an athlete, especially an individual athlete, it’s all about risk and reward, and the risks that you take and the things that you put on hold in life. I found that having come from Australia and being so focused on my athletics and getting to the Olympics that my friends were all getting very established in their careers, and becoming more and more senior. I continued to get educated along the way, but I started a couple of companies while I was still competing just to make sure I could get my business chops going. I knew that’s what I wanted to do. I always felt after I retired from athletics that I had some catch-up to do, and the way to catch up was to start a company and make that highly successful, as opposed to going the common route, which is to and work for IBM or one of the big boys and work my way up. It turned into an entrepreneurial catch-up situation. I’ve been addicted to the high-risk start up environment every since. I assume you’re watching the Olympics now. Thinking back to when you were a participant, what do you think has changed? I think it’s much easier for the athletes to get into a whole world of trouble these days because of the advent of Twitter and Facebook. You see it time and time again. Australians were banned for posting photographs of themselves holding guns on Facebook. A triple-jumper from Greece was sent home because she made a racist comment on Twitter. You just see so much more at risk. You’re in even more of a fishbowl now as an athlete than back before social networking. I see that as a big difference, but I still believe in the Olympic philosophy and competing. Competing is a great honor, and something that for me I’ll never forget. We’re having a lot of fun at the office right now because everyone’s keeping up with the Olympics. Our partner account manager, Tom Hoff, I’d known from the Olympic movement. He was a member of the US volleyball team in Beijing. He was the captain and they won the gold medal, so, we use and abuse that fact and have him show up at trade shows with his gold medal. Today we’ve brought our marching uniforms in and we’re going to be taking photographs. I’ve got my opening ceremony uniform and my competition uniform and he brought his in as well, along with his gold medal, so we’re going to take some photographs and have fun with it. Send me the pictures when you’re finished. Any concluding thoughts? 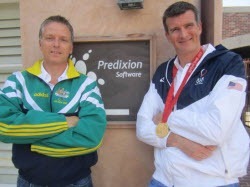 Predixion Software is in the business that is solving such massive problems for the industry. We really believe that we can save lives. Everyone here is just so focused on execution and being successful, because we truly believe that our technology can save lives and really help an industry that needs help. We’re really excited to be in the game and to be going for it. Great article on Predixion. My hospital just purchased them and I did not know they were former Olympic athletes. Our CMO and CFO can’t stop talking about how our organization needs predictive analytics but nothing about top athletes. Great interview and excellent foresight by Mr. H on the timing. Companies like Predixion excite me. We all enter so much data on a day to day basis that gets files into some electronic chart that rarely gets viewed. It’s time we start using that data to improve our patient outcomes. Hey if Target can predict when a customer is pregnant see (http://www.nytimes.com/2012/02/19/magazine/shopping-habits.html?pagewanted=all) healthcare workers should be able to predict factors that improve patient outcomes! Predixion is in the running for a Gold Medal!